Lindsay Hannon (vocals); John Pope (bass); James Harrison (keyboard), Russ Morgan (percussion). An expectant audience took their seats for the return of Lindsay Hannon for the first of three Northern Jazz divas engaged at the AJC over the next three months. However, our vocalist this evening experienced transportation problems fortunately resolved by bassist John. Arriving a few minutes late, harassed and out of breath, they recovered their composure to swing into their program with passion. James contributed the most wonderful keyboard accompaniment with youthful zest and energy while a new face, drummer Russ Morgan, drove the quartet forward. To describe Russ as a drummer is to undervalue his ability as a percussionist which was demonstrated skillfully all evening on the array of kit around him. Lindsay presented a variable collection of ballads in her unique style – a cool blend of familiar great lyrics and others sourced from her extensive repertoire which she delivered with emotion and empathy. The three guys behind intuitively played an enormous part in the presentations, each seizing the moment to engage creatively in a complete artistic process, working in close partnership. Our members responded with deserving applause on a very exciting musical evening. There are many superlatives that I could use to describe this quartet but I simply wish to say WOW, what a night! They are just that good. PROGRAMME: There Will Never be Another You; Bye Bye Blackbird; Nature Boy; Old Fashioned Hat; Love me or Leave me; Hissing of the Summer Lawns; Why Try to Change me Now? What if I Don’t Want TO? Don’t Get Around Much Anymore; What a Little Moonlight Can Do; Strasburg St. David (trio); Stompin’ at the Savoy, All I Do; Cheek to Cheek; Where Has all the Time Gone? So Long Big Time (blues); Jazz Voice ? Improvisation, Everybody Knows, Blues Monk…. With apologies to Lindsay if I didn’t catch it all. APRIL EVENT…..WEDNESDAY April 1. 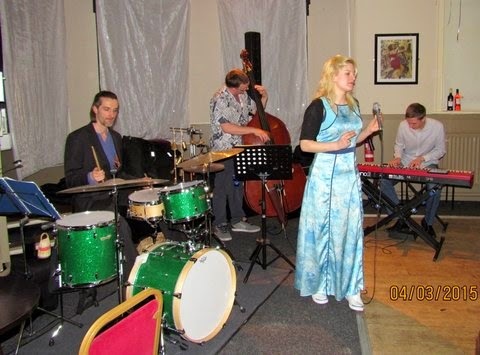 Katherine Simpson Quartet at the ELEPHANT 8.00 p.m.
MAY EVENT…….Wednesday. May 6. Zoe Gilby.